Situated on the northern portion of the Massachusetts Coast just off Sandy Bay, Rockport is more popular as a land-based vacation stop than a water-based place to rest up for the night. Rockport is 30 miles northeast of Boston and 28 miles south of the Massacusetts/New Hampshire state line. 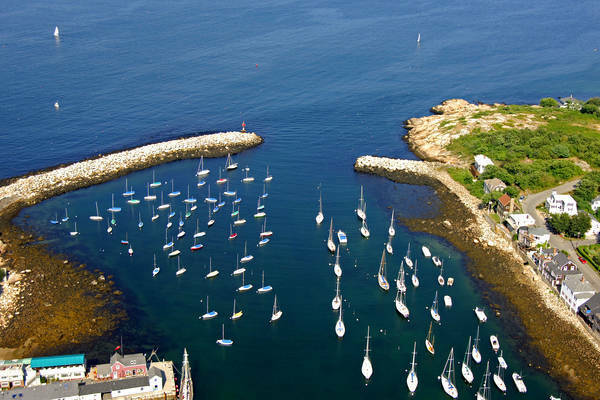 Rockport Harbor is unfortunately a difficult place to find a slip or a mooring to tie up to. 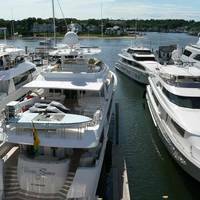 Most of the moorings in the harbor are private and guests moorings are not typically available. 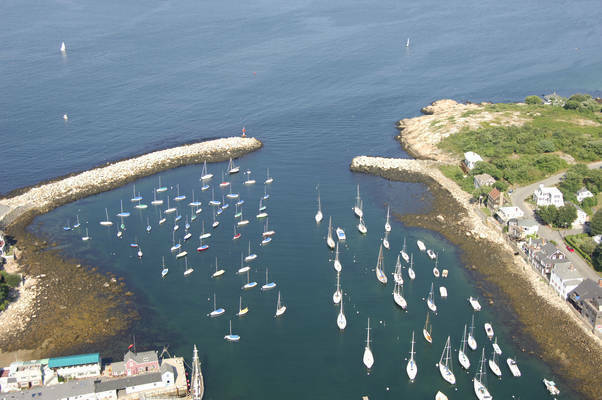 Slips are very hard to come by as well, but you may be able to arrange some sort of berth or mooring for the night by radioing or calling ahead to the town harbormaster. The image above is a view from the southwest looking northeast over Rockport Harbor where it meets Sandy Bay. Off in the lower-left-hand (northwest) corner of the image is the tip of Bearskin Neck and the north inlet jetty. Off to the right (southeast) is a rocky, grass-covered area called the Headlands. Sandy Bay, just outside Rockport Harbor, is protected from the northeast by a semi-submerged 1.2-mile long breakwater located just north of Striatsmouth Island and west of Pigeon Cove. 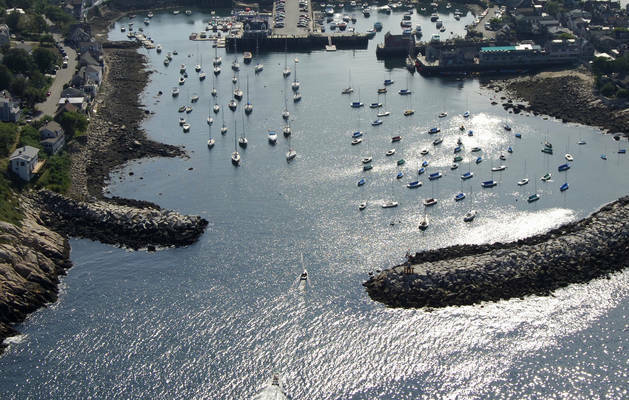 When approaching the Rockport area, you must pass either to the north or south of this breakwater. We will discuss both entrances here. 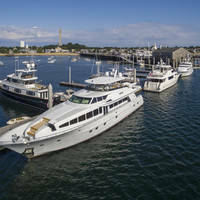 If you are approaching from the east through the south entrance, you must first place yourself just off the passage between Avery Ledge at the south end of the breakwater and the northern end of Straitsmouth Island. If you are coming into the area from offshore or traveling the area at night, the Straitsmouth Island Lighthouse (46 feet above the water, flashing green every four seconds) provides an excellent guide. 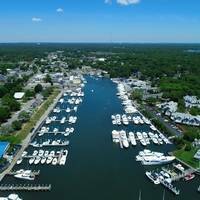 From offshore, first set a course to intercept the area near waypoint N42 29.898 W70 34.607, which is a bout a half-mile east of the passage between Avery Ledge at the south end of the breakwater and the northern end of Straitsmouth Island. From here, set an approximate course of 288 degrees magnetic for about one mile. This will take you past flashing red buoy 2 at Avery Ledge (the south end of the aforementioned breakwater) and the north tip of Straitsmouth Island. At this point, you should be able to see green can 3, which marks a rock ledge to its south. From green can buoy 3, set a course of about 268 degrees magnetic for .5 mile to intercept red nun buoy 4 just northeast of the harbor inlet. From here, flashing red 6 (visible in the image above) marks the harbor entrance on the north inlet Jetty. Controlling depths inside are seven feet. The northern entrance is wider and a little bit easier to transit. From the north, first set a course toward flashing green buoy 3, which is located near waypoint N42 40.823 W70 36.157. Once you have arrived in the area of the buoy, make sure that you leave it decidedly to port heading south. 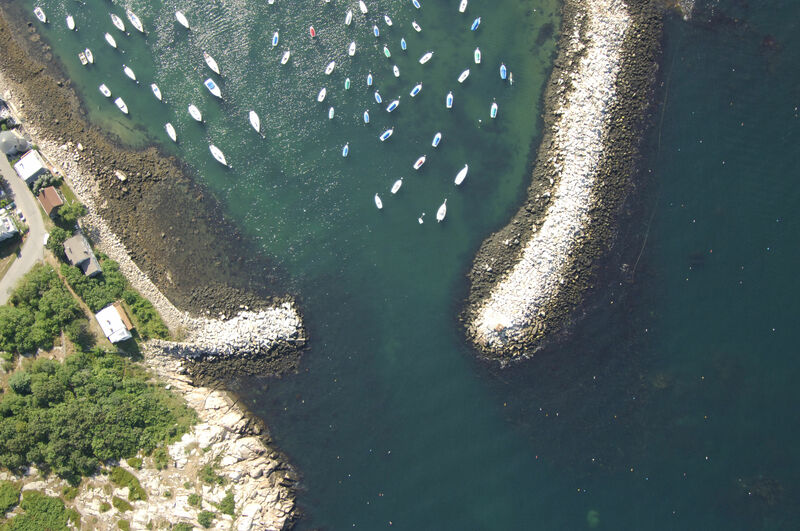 From flashing green buoy 3,set a course of about 214 degrees magnetic for approximately 1.3 miles to pick up red nun buoy 4 just northeast of the Rockport Harbor entrance. From here, flashing red 6 (visible in the image above) marks the harbor entrance on the north inlet Jetty. Controlling depths inside are seven feet. No reviews yet! 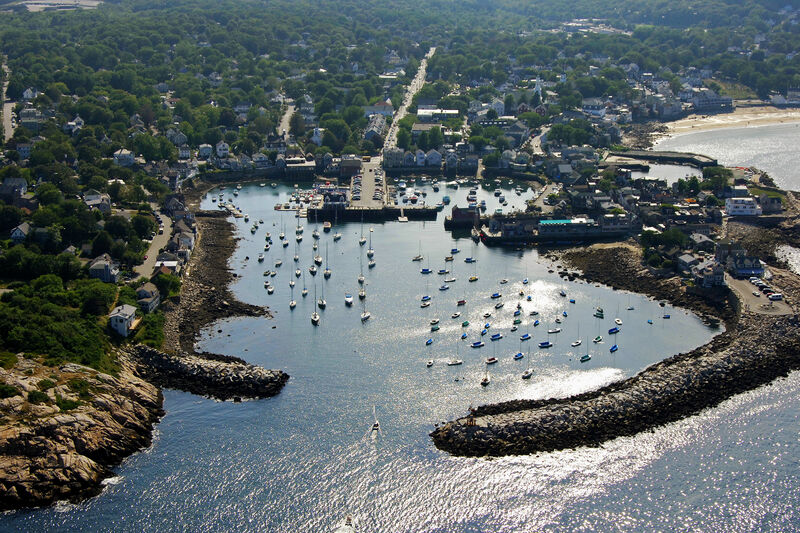 Be the first to write a review of Rockport Harbor Inlet.